A trip to the shoals yesterday morning was not as successful as one would have liked! Due to some trouble getting going, a second trip to the ramp had us departing at about 6.30am. Some 2hrs later than anticipated! Unfortunately for us, this meant we missed the early morning glass out and had to slop our way out in a stiff 10-15knot breeze, one that just kept building the further we went. By the time we were within 10km of our mark we were down to about 30km/h. But too close to stop and go back. It took us a minute to locate the school of fish around the mark, but when we did the sounder lit from top to bottom. We really thought our luck was about to change. But alas, it wasn't. Dad dropped pillies and I ripped Bumpa-bars through the school. But we couldn't entice the fish to feed! We drifted the mark a good dozen times before we concluded that it just wasn't going to happen here. In the drifts we had done I managed 1 undersized Mackerel and Dad had had a few pickers and a bite off. Time for a new location. We then headed to the Mackerel grounds where there had been a few boats working when we went past on our way out. By the time we returned only a few remained. But one was hooked up, so that was promising. Dad pulled us up straight onto a school marking the sounder. 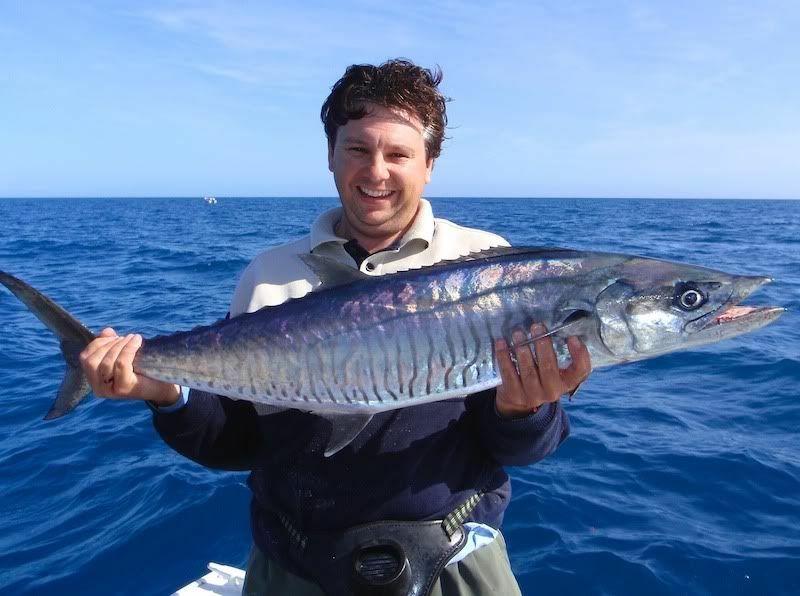 I dropped the metal slice and within a few turns of the handle a Spanish Mackerel was screaming off against the drag of the TwinPower 6000FC. This was a good fish, but didn't take long to have boat-side. An excellent shot under the gills with the gaff by Dad and he was on board. Our fist decent fish of the day was in the eski and mackerel were cutting up on the surface in places, an indication luck was changing! Or was it? From this point on we had real trouble locating the school, and when we did they moved off very quickly. I got a bite off on another drop, but apart from that it was all over. Other boats had now left the area and things looked quiet. I think we arrived right on the tail end of a good bite! The price we paid for getting going late. On the positive side the wind had backed right back and it was turing into a great morning. We tried some trolling of gar for a bit and then headed to Salamander for a look-see. Then a last ditch effort at the weedbeds and off home for us. Luckily that one fish was a good one, probably 10-12kg, so we have gotten plenty of good feeds of him.